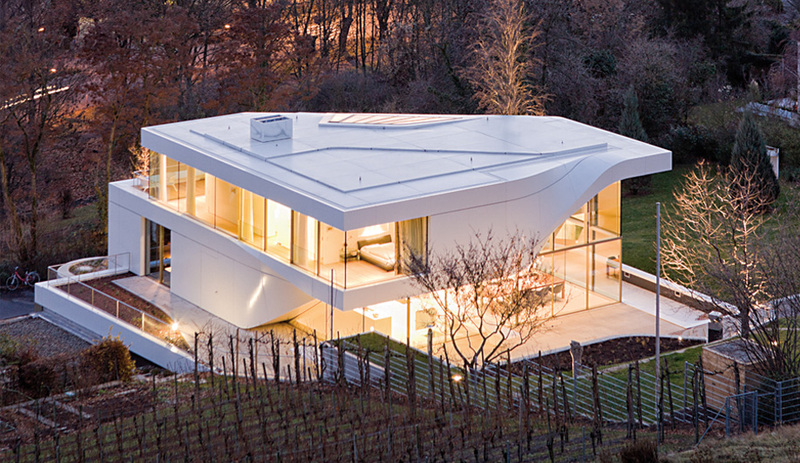 Located next to a vineyard, the three-storey house is perched on a terraced hillside. It takes on remarkably different appearances from every angle. 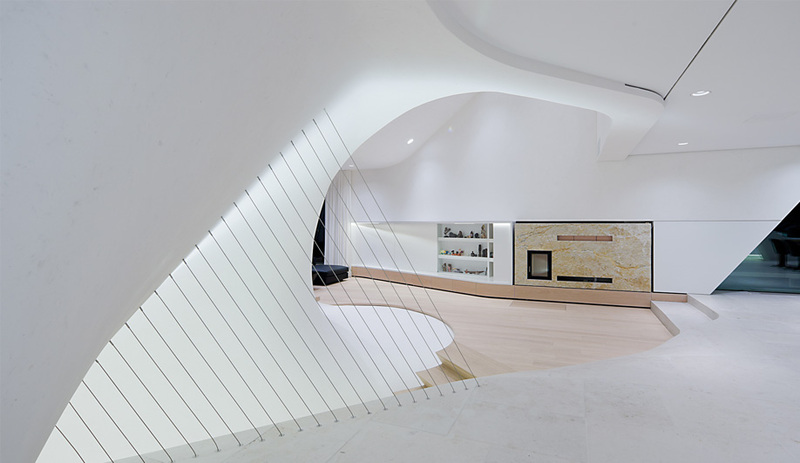 The most striking feature, visually and structurally, is a load-­bearing S‑shaped stairway that connects all three levels and guides the organization of the house. To maintain the drama of the staircase, UNStudio used cables as a discreet protective barrier. A large fireplace fills part of a wall near the entrance; its facade is make of one piece of locally sourced stone called Jurakalk. A library provides a solitary alcove, though not an enclosed one. 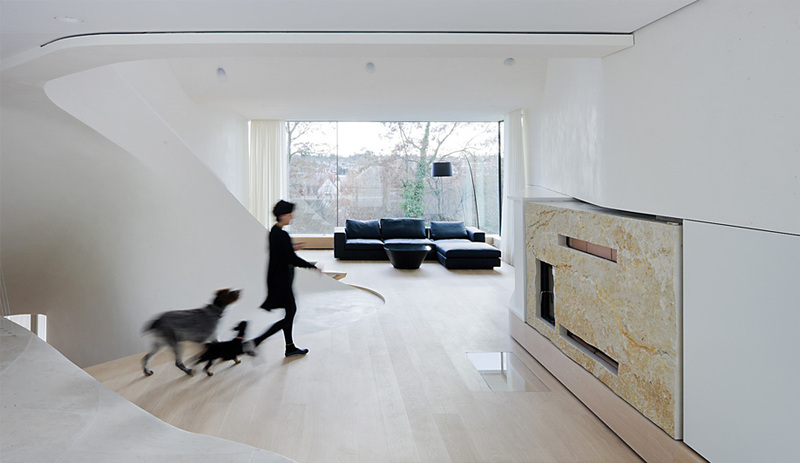 The house is designed to blur boundaries between private and public space. The Corten countertop, custom designed for the house, extends outside to the patio area. 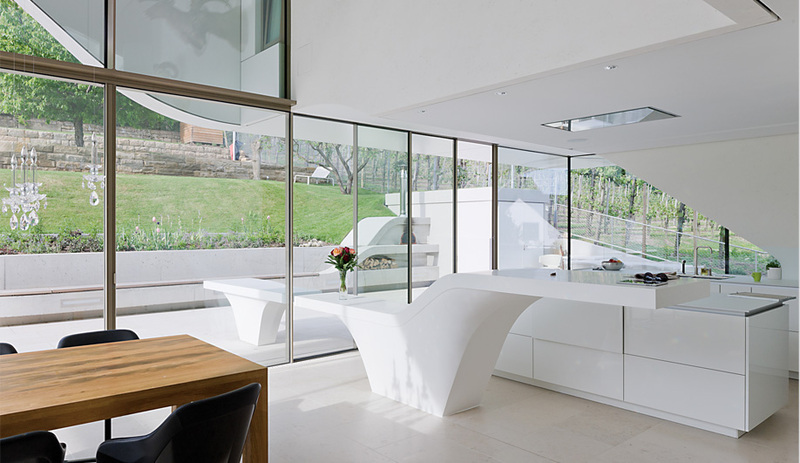 UNStudio custom-built a white Corian kitchen table that extends outdoors, its form mimicking the curves of the house. 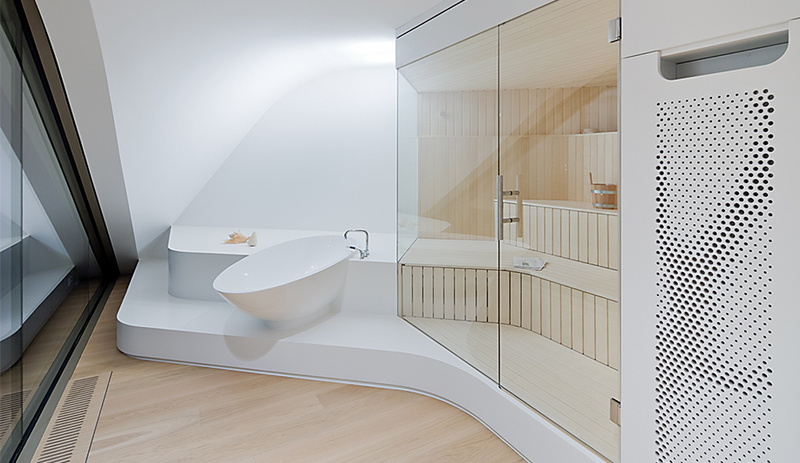 The third floor wellness area, with its egg-shaped bathtub and wooden sauna, offers a sensual experience. 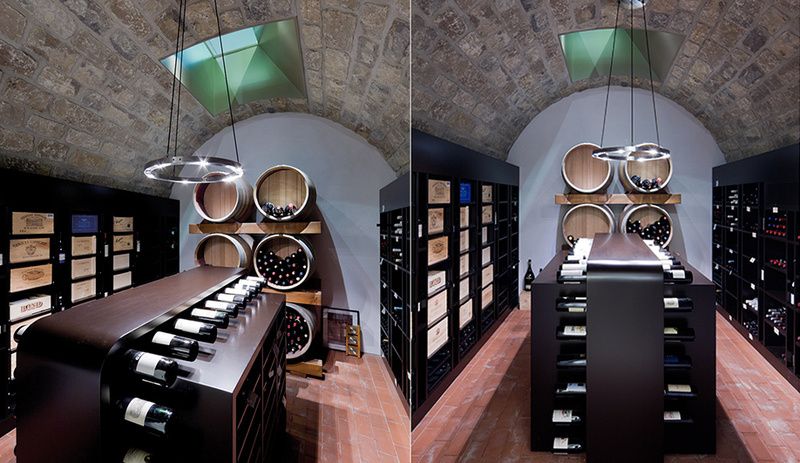 A glass opening on the second level looks down into the wine cellar one floor below. 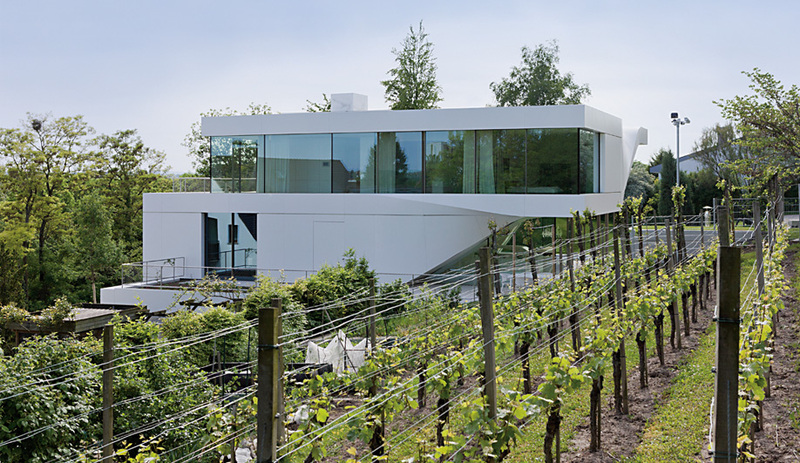 It’s not often you find a functioning historical vineyard in a suburb, but that’s what adjoins one new family house located on a craggy hillside on the outskirts of Stuttgart. Well-cultivated rows of grapevines fill the nearby lot, while in another direction the site offers sweeping views of rooftops and distant city lights. 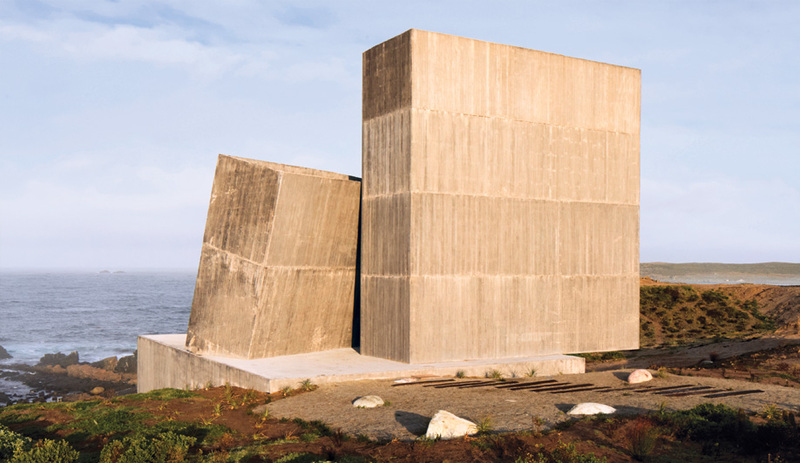 The newly built, 920-square-metre cast concrete home, designed by UNStudio, fits into the landscape like a glove, with both volume and roofline responding to the rising terrain. For the client, retaining the big-name Amsterdam firm to dedicate time and attention to a private residence was a major coup. UNStudio has completed such high-profile projects as the Mercedes-Benz Museum (also in Stuttgart), the dramatic Erasmus Bridge in Rotterdam, and a luxury department store in South Korea. “I’m excited to do house projects, but at the same time careful; they can absorb an enormous amount of time and money,” van Berkel says. However, when the clients contacted him after spotting one his best-known houses in a magazine (the Villa NM in New York, which has since burned down), he was intrigued. “On the one hand, they wanted a beautiful house, but they also have a keen interest in architecture,” he says. Their specifications outlined the number of square metres for each room – an attention to detail virtually unheard of. Like Villa NM, Haus am Weinberg is defined by a central twist, a dramatic departure from traditional construction in which the three-storey house literally twists from within, following a series of diagonal movements that allow for just four support elements: an elevator shaft, two pillars and one inner column. 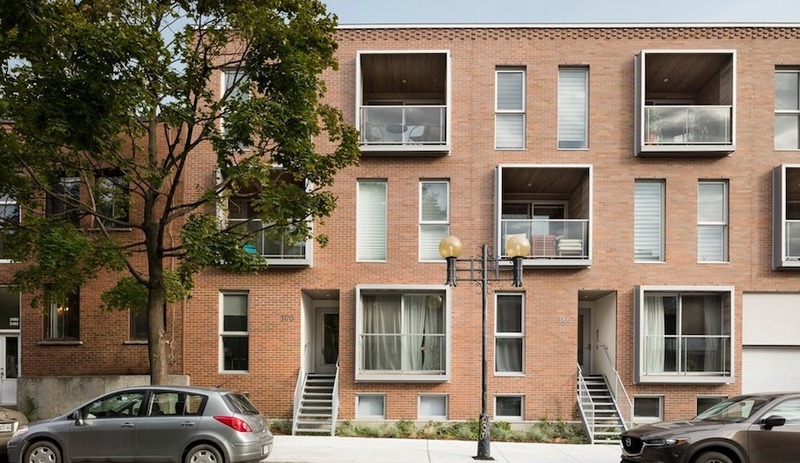 In turn, minimizing structural reinforcement allowed for glazing on all four corners. 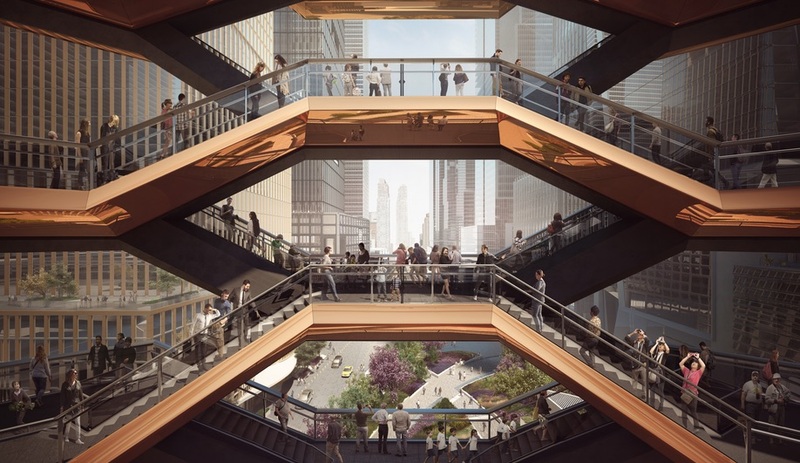 Interior circulation is organized around an S-shaped stair that begins at the southern facade of the lowest level, just inside the main entrance. Partially integrated into the hill, this floor includes a two-bedroom apartment for guests and the owners’ college-age children, and a climate-­controlled wine cellar. The stair curves up to the second level’s living area and open kitchen-dining spaces, where the coveted mountaintop is prominently viewed through double-height glass. In good weather, glazed walls on two sides of the dining area open fully, completely blurring the boundaries between inside and out. The stair concludes on the third floor with a gallery space, a master bedroom, an ensuite bathroom and a wellness area with sauna and terrace. White surfaces are everywhere, with floors alternating between pale oak and slabs of light grey local stone. The kitchen cabinets are lacquered white, and muted white clay stucco walls unexpectedly sparkle when daylight hits embedded reflective stone. 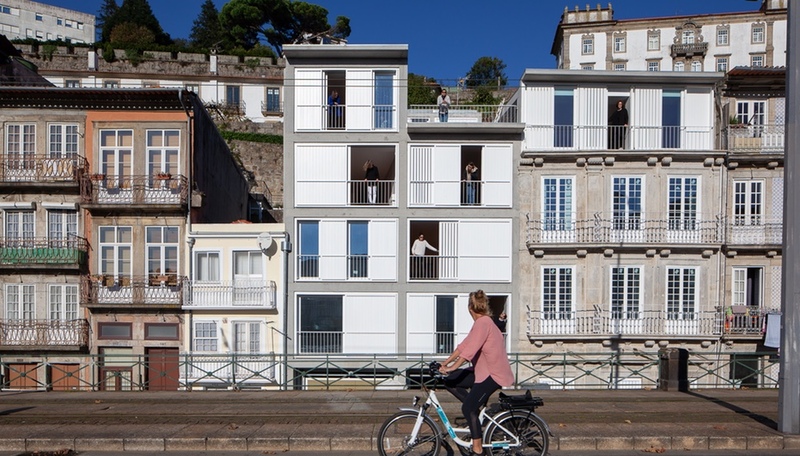 “I’m so against normal stucco, especially in such a special house, so we made it a little shiny,” van Berkel explains. Further interior accents reveal what he calls the client’s “secret life.” Above the four-metre-long solid oak dining table, LED lighting circles a mounted stag head between two ram heads. The wild game theme carries through to the music room, where surfaces suddenly turn dark and brooding and stuffed hunting trophies – including a cheetah, a bear, and the heads of a boar and several deer – loom from the walls. “It’s like stepping into another world of their life,” says van Berkel, “the way a good dream can also turn into a bit of a nightmare.” In contrast, a room adjacent to the kitchen houses a 20-square-metre shower – for the dogs.